This description of the Book of Lamentations is from Easton's Bible Dictionary. "Lamentations, Book of: called in the Hebrew canon 'Ekhah, meaning "How," being the formula for the commencement of a song of wailing. It is the first word of the book (see 2 Samuel 1:19-27). The LXX. adopted the name rendered "Lamentations" (Gr. threnoi = Heb. qinoth) now in common use, to denote the character of the book, in which the prophet mourns over the desolations brought on the city and the holy land by Chaldeans. In the Hebrew Bible it is placed among the Khethubim. The book consists of five separate poems. In Lamentations 1:1-22 the prophet dwells on the manifold miseries oppressed by which the city sits as a solitary widow weeping sorely. 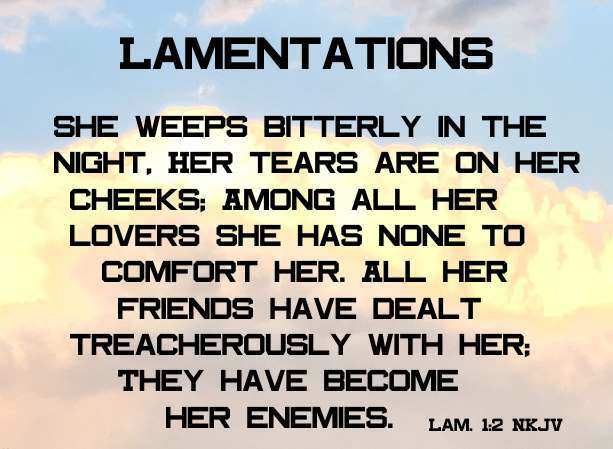 In Lamentations 2:1-22 these miseries are described in connection with the national sins that had caused them. Lamentations 3:1-66 speaks of hope for the people of God. The chastisement would only be for their good; a better day would dawn for them. Lamentations 4:1-22 laments the ruin and desolation that had come upon the city and temple, but traces it only to the people's sins. Lamentations 5:1-22 is a prayer that Zion's reproach may be taken away in the repentance and recovery of the people. The first four poems (chapters - Lamentations 1:1 - 4:22 are acrostics, like some of the Psalms (Psalm 25:1-22, 34:1-22, 37:1-22, 119:1-22), i.e., each verse begins with a letter of the Hebrew alphabet taken in order. The first, second, and fourth have each twenty-two verses, the number of the letters in the Hebrew alphabet. The third has sixty-six verses, in which each three successive verses begin with the same letter. The fifth is not acrostic. Speaking of the "Wailing-place (which see) of the Jews" at Jerusalem, a portion of the old wall of the temple of Solomon, Schaff says: "There the Jews assemble every Friday afternoon to bewail the downfall of the holy city, kissing the stone wall and watering it with their tears. They repeat from their well-worn Hebrew Bibles and prayer-books the Lamentations of Jeremiah and suitable Psalms.""